"Chandigarh is covered in a haze that is normal for the end of the monsoon." And with a gentle thud, a brief float and another thud, we were on the ground. As we rushed to vacate the runway to allow an Indian Air Force IL-76 to take off, the phone rang. "Six Centuros await you sir!" It's always a good day when you land in a new place and there are six motorcycles waiting for you. How are the motorcycles? "Terrific sir, they're all brand new." Well, it gets better. The rest of the day went by in a rushed blur. There were number plates to be put, papers to be checked and some OVERDRIVE-style decoration to be completed. That done - thank you Chandigarh Auto Care, you guys are terrific - we raced to a superstore to pick up supplies. Going to Ladakh is always an exercise in planning for a contingency. 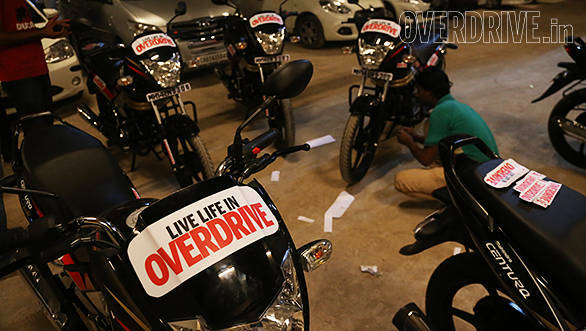 Joshua Crasto, a long term friend of OVERDRIVE, Garage 52's ultra-dictator and Rise Above Ride planner man's idea of a contingency was staggering. Picture a full-size shopping cart full of chocolates, instant noodles and I kid you not, 40 litres of water. 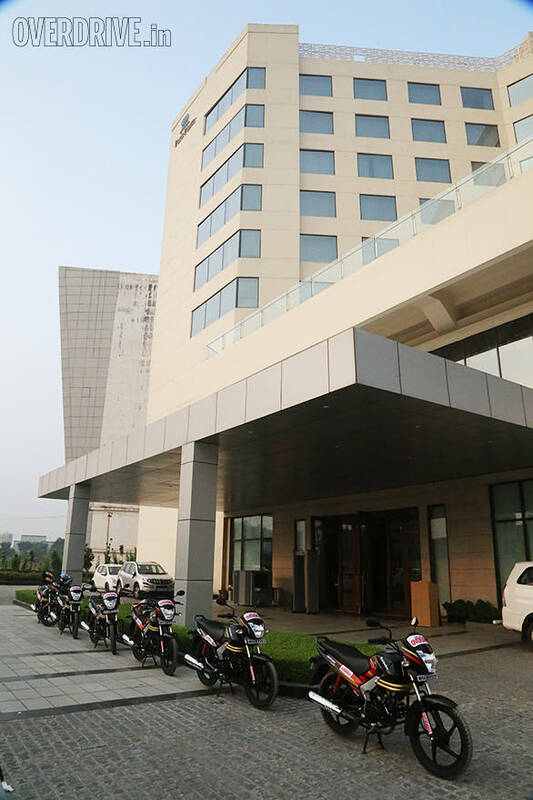 Meanwhile back at our base, the ever-lovely Park Plaza in Zirakpur, more Rise Above Riders were arriving - you'll meet them shortly. The people you know are our ace photographer and video guy, Suresh Narayanan. Ensuring he gets his cameras filled to the brim was Alan D'Cruz and on the bikes were Joshua, me and Jamshed Patel. Plus our guests. After a long conversation about the riding day ahead, everyone went to their rooms to catch some sleep. Tomorrow was going to be a long day. 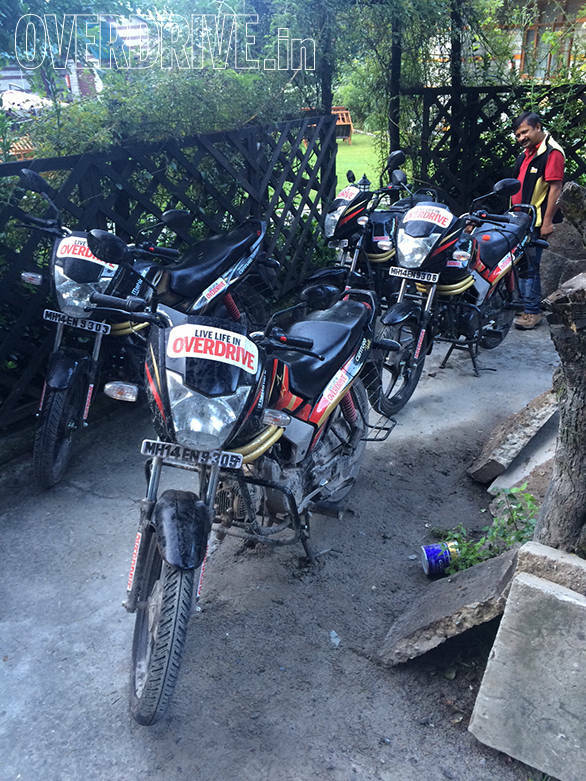 An early start would see us race up the mountains on our Mahindra Centuros to Manali, over 300km distant. The ride was going to be relatively easy but the aim was to get the riders to understand their new machines, figure out the dynamic of riding in a group and of course, have a great riding day. And now, since it is three hours before my alarm goes off so that I can start getting ready to ride, kindly excuse while I catch forty winks. Six gleaming Mahindra Centuros stood idling in the porch of the Park Plaza at Zirakpur. The hectic running around of the previous day had done the business. All that was needed was for the six of us to clamber on board, point the broad headlight towards the mountains and roll out. Leaving Chandigarh for Manali isn't for the faint of heart. The initial highway is narrow and undivided and is peopled by traffic consisting of those who seem to have only one destination - the casualty ward of the nearest hospital. But we sliced through this madness with speed and precision. 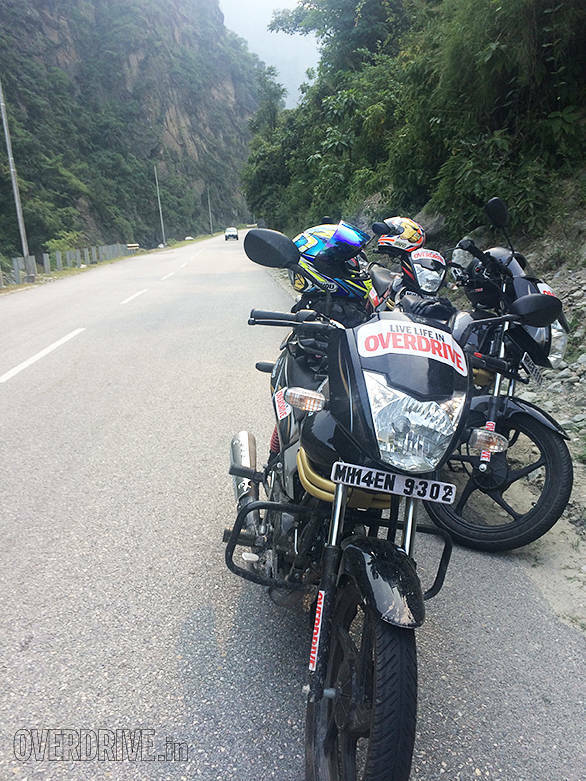 Energy levels were high, the road was long and we were all humming tunes within our helmets. When the mountain roads began, there was a little disappointment to be sure. The NH21 was this amazing ribbon of winding black tarmac the last time we buzzed it on a motorcycle. This time, it was shattered and desperately in need of a complete new do over. Massive potholes, broken roads, traffic making random direction changes to avoid both... let's just say, it was a very involving ride. A long fourteen hours later, we rolled into Manali. As we sat down to dinner, two things were very clear. 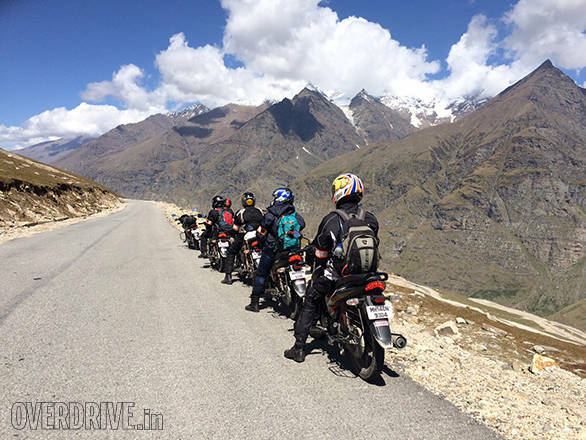 First, the hard part of the ride begins tomorrow, when we cross the Rohtang pass, our first high-altitude pass. The forecasts are all dire - there's negative temperatures, snow, rain and thunder waiting for us, it seems. And second, the Centuros are proving to be hardy little motorcycles that are exceptionally agile and are able to handle both the punishment and the smoother corners (the few we got) really rather well. Tomorrow, we cross the Rohtang Pass, stop at Khoksar at Sharmaji's Dhaba for his famous meat rice before heading for Jispa. If it all goes to plan, it should be a fairly short but spectacular riding day. The network connectivity will be iffy once we cross Rohtang and so the updates will cease for a few days. When a 150km ride takes eight hours, you start to get worried. Just a little bit. Because the next day contains three passes and 220 kilometres. But let's back up and go back to where it begins. 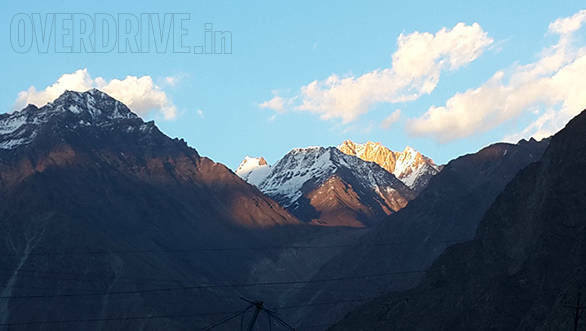 After a good night's sleep in Manali, the six Mahindra Centuros began to climb to Rohtang early in the morning. Heading for Leh this late in the year is considered a bit risky because the weather, especially as night approaches up in the mountains can be unpredictable. On the other hand, by this time, the flow of tourists is down to a trickle and that means the famous jams of the climb up to the pass simply never happened. The roads were largely in good shape and the immense army convoy we had to pass - the whole day in fact - turned out to be driven by super polite drivers who allowed us to pass as soon as they saw us in the mirrors. Up at the top, it was cool, bright and sunny. And the whole plain before the actual pass itself - marked by a cluster of prayer flags - was littered with trash. Rohtang has to be the saddest looking of all mountain passes. I've seen it once in the middle of a cloud with an approaching sunset. That day you couldn't see the pockmarks and it looked magical. When it's clear though, it's just an epic mess that you want nothing of. So we sat, sigh, for nearly an hour eating a delicious hot lunch - Maggi, omelettes, bread and other mountain delicacies. Then we headed down to Koksar where Sharmaji (actually the Kamring Dhaba) and his legendary meat rice awaited us. The climb down was fun. The road was in good shape - even the dirt bits. Our guests were losing their fear of the dirt - a good thing because there's a lot of it ahead - and the pace was rapid. The Centuros also felt tough and unlikely to break, so bashing cheerfully over bumps and lumps seemed like a good idea. I guess the sole issue was that we climbed down so fast that we were sitting in Sharmaji's tucking into meat rice (and rajma for those who choose to remain uninitiated) before the Maggi was digested. But the mood was good. Everyone was feeling okay, we'd managed to escape mountain sickness and its effects for the moment and we knew the run to Jispa was a good one. Back on the road, the initial stretch was in terrific nick and while I was sweeping the convoy, I had a great time falling back and then cornering as hard as I wanted for a few corners at a time. 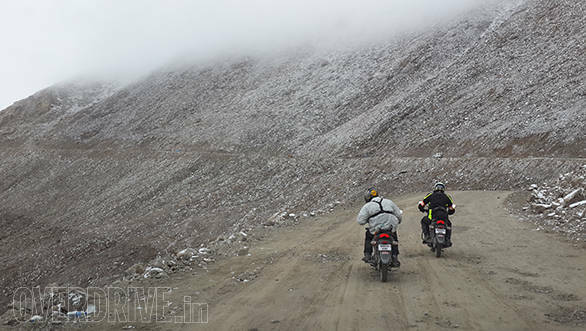 The road eventually dissolved into a mess of that fine Ladakhi dust. You could see construction crews working away but when we rolled into Tandi, the place with the famous petrol pump, our gear looked like it was dusted with flour. Which provoked no comment from anyone so I'm guessing flour-dusted bikers are a regular sight at Tandi. Anyway, fuel filled - despite the altitude and how hard we were pushing, our bikes were returning a steady 40kmpl, we're happy with that - we headed out. After an indifferent road into Keylong, we hit the road I was looking forward to. The run to Jispa is a perfectly surfaced tarmac road that turns and twists like a snake doing the quickstep. The sun was out, the Centuros were singing and we rolled into Jispa in no time at all.Bikes parked, we lumbered up the steps of the Ibex Hotel to get showers and an early dinner. Day Three was going to be a tough cookie. We had a long way to go to our camp near the Tso Kar lake at the end of the More Plain. Along the way were the Baralach la, Lachulung la and Nakee la passes. We would start at 4am in the bitter cold and aim to ride for two hours before the sunset greeted us. And then some guys brought their sensor-loaded digital watches and said, "Guys, the [atmospheric] pressure is dropping. I think we have weather coming in." Tso Kar is a pretty lake with brackish water, a marshy shore and an unpleasant smell. The camp next to it, one we have used often, is the same mix of visual appeal and tough conditions. But first, we had to get there. We started from Jispa at 04:30am. It was very cold and as usual, we were to miss the glorious sight of the Darcha valley thanks to our penchant for long distances and early mornings. When dawn broke, we crossed the wee beauty that is the Deepak Tal and carried on towards the first of three passes for the day, Baralachala. The climb was tough on our Centuros but they fought off the steep roads gamely and soon we were in Bharatpur sipping tea and waiting for noodles and omelettes. Then we started forward towards Sarchu. Sarchu is usually a spectacular plain with a deep river in the distance running through it. Camps dot the grassy plain normally but two were being packed up and one seemed to still be up and running. A clear sign of the coming winter. Soon the snow would come and the area would be closed for riders. After Sarchu comes the spectacular Gata Loops. An insane set of hairpins that climb a mountain and set you up for the climb to Nakeela. So high do the loops take you that arriving at the top of Nakeela is almost a non-event. Having passed another of the super polite army convoys, we descended down to the valley before ascending once again to crest Lachulungla. This pass, at over 16,000 feet, is a proper high altitude pass. It's a visually spectacular climb but even more spectacular is Pang on the other side. Pang was a tough gig. It's all dirt roads and the Centuros took epic punishment. Endless stones and dust worked the chassis hard while a white layer of dust on our gear and on the bikes was almost a rite of passage. When we stopped for lunch at Pang, all was not well. One of our participants was clearly suffering. At the Pang army camp, the kind doctor examined her and asked her to return to the plains if possible. That's how tough the place is. We installed her in our camera car with an oxygen cylinder and then carried on. Next up was the More Plain. Words cannot describe the magnificent, austere beauty of the plain. It's largely covered in scrub and extends away from you in every direction before meeting mountains of epic scale and colour. Towards the end of the plain lies Debring where were to take the dirt road to Tso Kar, our stop for the night. The plain was fun. A terrific tarmac road runs through it and after a trying day, the Centuros finally got some space to stretch out and play. We were enjoying the surprising cornering abilities on the few sweeping corners while the suspension kept the few bumps from ruining the fun. The sun had gone behind the mountains by this point and the plain was a cold place to be. Having crossed the final stretch of dirt road, we rode into camp. It was cold, the wind was picking up and the promise of a trying night lay ahead. But the drama was just unfolding. Our camp wasn't a high pass but at 14,500 feet it's a properly get-sick type high. Two participants were already showing signs of altitude sickness setting in. After all a fourteen hour ride may be a normal day at work for us but it doesn't make it any easier. 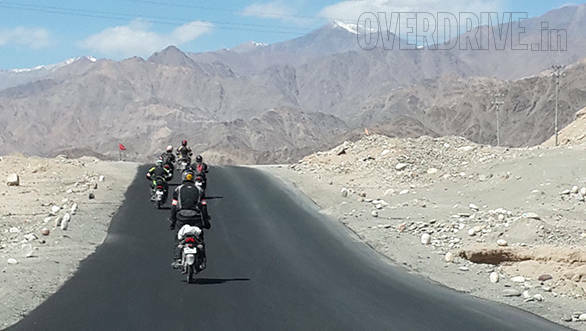 We had covered 225-odd kilometres at an average height of about 13,500 feet or more. Not a tourist event, this, then. Our wee Centuros held up but our riders were flagging. After a quick tete-a-tete, we decided that the lady participant would be safer in the hospital in Leh. Poor Alan and photographer Suresh were roped into driving the camera car over the 17,500 feet high Tanglangla pass and get her to Leh. The remoteness of the region meant that as soon as the trio left, we had no way of checking on them. Meanwhile, the second participant was under five heavy quilts, on medication and on oxygen. Would he be able to recover enough to ride on the morrow? Would Sonali, the girl participant be okay? Would Alan and Suresh be able to cross that pass in the night safely? It was with a lot of questions screaming through our heads that finally sleep came. Only the shocking cold of the night and endless flapping of the tent walls remained. After a bitterly cold night that left the taps frozen, we woke up to another perfectly clear sky. It wasn't much warmer but the mood was on the up and up. 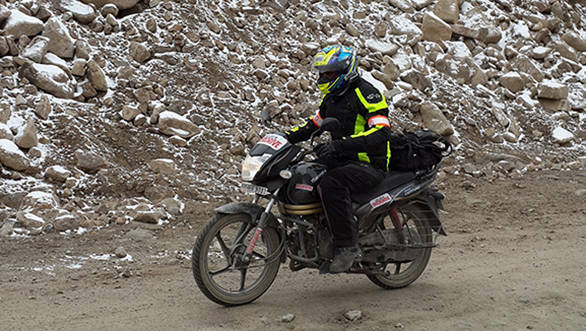 This was to be a short crisp ride into Leh crossing only the Tanglangla. Of course at about 17,500 feet above mean sea level, you call Tangalangla only at your own peril. First, we crossed the three kilometres of dirt from the camp to the highway through the magnificent More Plain. Most of it is packed dirt but there are patches of deep, soft, powdery soil that really shake the bike up. But soon we were on the tarmac highway buzzing merrily towards the pass. The Mahindra Centuros were singing along at a lovely clip. Evidently the flatness of the plain compensates for the nearly 14,000 feet height of the plain. Then began the climb. Tangalangla is a tough pass for small engines. Apart from its height, it's also a long, steep climb and feels endless as the road winds around the mountains before it gets to the top. But then again, most of the climb is now fresh tarmac so climbing should be easy. Of course, it wasn't. The bikes found the gradient and altitude a tough combination. They never quit on us but soldiered on gamely uphill at speeds as low as 19kmph in top gear going flat out. How tough do you think the conditions are when your engine can only make a quarter of its normal power, eh? Eventually we crested the top. It was very cold but bright and sunny. Within moments you could feel the lack of oxygen. And as soon as the obligatory pass-top image was captured, we headed down in a tearing hurry. 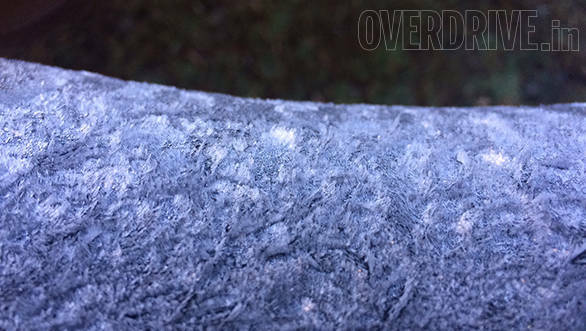 Team OD, for instance, could immediately feel that lightheadedness that precedes headaches and worse. Luckily the downhill stretch is picture perfect tarmac and progress down to Rumtse is fast. We stopped at Rumtse to catch our breaths and some breakfast. More Maggi and omelette toast later, we rolled the final 100km into Leh. Tomorrow, we wash the accumulated muck off our bikes and otherwise just lounge around. The day dawned clear enough - there was the promise of blue skies and sunshine as our convoy rolled out. Sonali, who'd been taken to hospital with a mild case of Acute Mountain Sickness (AMS) had chosen to sit in the photography car instead of ride, so we were down to five riders. As we climbed towards South Pullu, the checkpoint where you register before you start climbing up Khardungla, another bike disappeared. Half an hour later, our ride leader Joshua Crasto rolled up to say that Adeeb Shaikh, mounted on Bike 3, was not going to be able to ride either. We retrieved the bike, loaded into our Mahindra Pik Up backup truck and installed Adeeb into the car. Above us, the pass - visible from South Pullu - was shrouded in an ominously dark cloud and it was bitterly cold. Moments later, while we sipped the last dregs of our tea, the clear air was punctuated by flurries of snow that swirled cheerfully around us. Faced with a tough climb and now, the prospect of snow, the cheer completely escaped us. With our game faces on, we pointed our Centuros up the mountain. This would be a tough challenge. 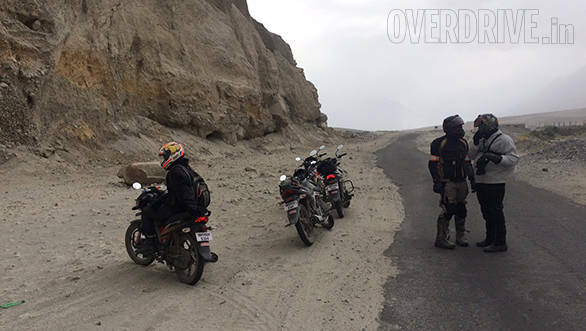 The problem with climbing big mountains on small motorcycles is easy to understand. For ideal combustion, the air-fuel ratio is supposed to be 14:1, though in the real world, 12 or 13:1 is usually slightly better. When you have more fuel in proportion to air, we call it a rich mixture and when we have less fuel than air in proportion, we call it a lean mixture. What happens as you ascend is that the air pressure as well as the oxygen content drops. So a carburettor running a 13:1 mixture automatically becomes richer and richer. On the motorcycle, this means the exhaust gains a strong smell of petrol as unburnt fuel exits the exhaust. With this comes a drop in power and if you go high enough, a very real chance that you'll wet the plugs with fuel and end up stalling with misfires. The smaller the engine, the more the drop in power affects you. Which is why most riders on the passes we met looked at our Centuros with great trepidation and concern for our mental health. We paid them no mind as we chugged uphill. We were holding about 17-19kmph flat out in third gear. This doesn't sound like much, but steady uphill progress on broken roads, rocks and some ice while braving snow flurries and near-zero temperatures is a godsend. And since we passed a number of other motorcycles including a certain motorcycle that's regarded as the tool to conquer mountains with, I think a little gloating is allowed. 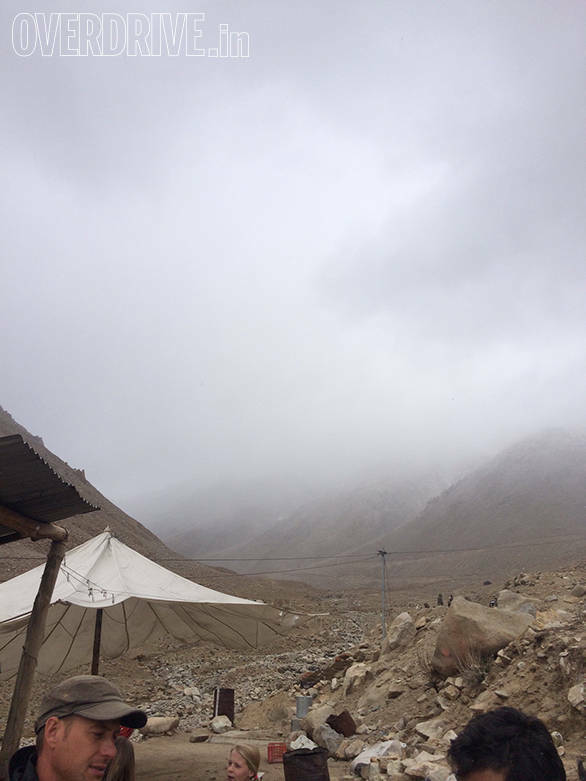 The top of the pass was relatively empty - Khardungla Top can be a crazily-crowded nutty place despite the sign that says, "Staying at K-Top for more than 20-25 minutes can be harmful to your health." Obligatory photos taken, we rapidly began our descent before anyone became too light-headed, nauseous or otherwise AMS-ill. 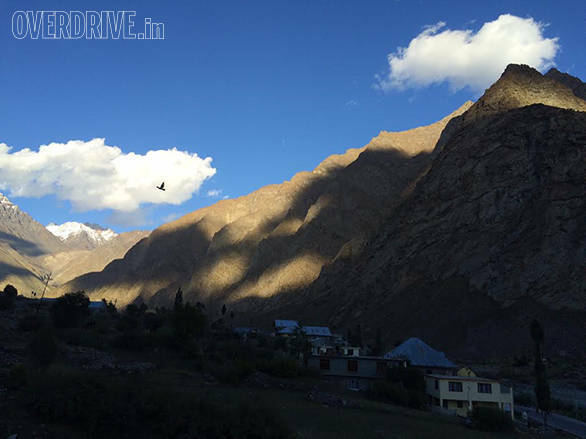 When we reached North Pullu, the checkpost on the Nubra side of the pass, the snow flurries had gained in strength but the clouds were not so thick, so there was some sunshine as well. It was a strange sight, but we knew K-Top was behind us and that the roads to our camp for the night in Diskit - about 60km away - were in terrific nick. It turned out to be a great ride. The Centuro is a terrific little cornering demon and over the thousand-odd kilometres we had come so far, we'd come to trust its tyres and chassis to reward our efforts. The road from North Pullu to Diskit winds along the sides of the mountains down to the camp in Diskit with unending, unflagging enthusiasm. Mostly, downhill, we were blatting at 60-70kmph around the corners, watching for rocks, dirt and sand in the middle of the road. It was perfect. It was cold but the sun was out. There was some sand, but the tarmac was unblemished and fresh. The Mahindra Centuros were singing and I, for one, was following the convoy with a lusty song on my lips and a great big smile on my face. At about 3pm, we rolled into camp knowing that the Ride had Risen Above. K-Top has been crossed and our job was done. We did have to cross Khardungla (and the five other passes) on our way back to be sure, but the ride's objective was now complete. This realisation was important because while the skies were clear towards Turtuk and Thoise (places to reach if we carried on), dark, pregnant clouds closed off the view towards Khardungla. Maybe the vagaries of the Ladakhi winter would catch us after all. The morning dawned clear enough at our camp in Diskit. The monastery above us glittered in the sun while one by one the dark peaks were rendered in orange by the rising sun. Having wiped a thick layer of overnight frost off our Centuros, we allowed them to idle in the sun and warm up while we grabbed ourselves some breakfast. Climbing back up from Diskit to North Pullu was fun. Once again, uphill roads and high altitudes were robbing the Centuro of power and we were making up for it by allowing the suspension to soak up bumps and the handling to keep momentum and pace. It was very cold. Through my thick winter gloves and my waterproof boots, I could feel the cold settling in. 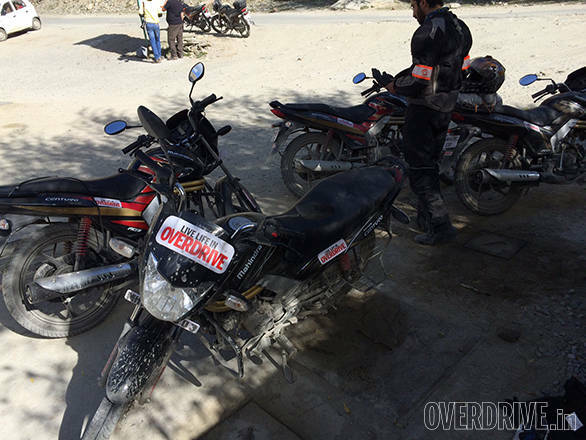 Everyone was thankful for a quick tea stop in the village of Khardung. Then a truck driver stopped. He had come down the pass and he looked at our wee Mahindras with great concern. "There's ice on the road, be careful you all." We waved him an uncertain but thankful goodbye and carried on. At North Pullu, the mountain stood before us shrouded in a new coat of white snow. Traffic was moving. We could see Mahindra Xylos and Boleros inching their way up and down the mountain plus the everpresent forces trucks. We decided that if they could hack the cold mountain, then so could we. Forward ho! Four corners later we realised the peril we were in. A truck came sliding sideways around a corner while we slid to a halt on an iced up road. When my bike, switched off, in gear, brakes on, started sliding backwards towards the wall and putting my feet down seemed to have no effect, I finally understood how precarious the situation was. Two other bikers, also stranded in that corner helped stabilise me. But I quickly figured that the solution was to get off the packed ice and head up on the unmarked snow which in traction terms is like fresh mud - not perfect but useable. From there to the top, for me, was a simple matter of chugging uphill in first gear using small throttle inputs and planning my route so my wheels stayed on the fresh snow. In a few places, I used the fresh tread marks of a recently passed SUV on ice to cross stretches where fresh snow was thin on the ground. And an hour later I arrived at K-Top with only three-four big slides to show for the climb. Then I noticed that I was alone. The other Centuros were somewhere behind me. Turns out they were having quite the adventure. Jamshed nearly got sideswiped by our own backup truck. He was stranded in the ice when the truck decided to pass them and park so he could be helped. Joshua decided that the fresh snow may have packed ice underneath and since most was on the edge of the mountain, it was too great a risk. The three Centuros were fighting their way up the mountain inch by inch on ice, trying to stay on the icy slush where the SUVs and trucks had torn the ice up. It was tough going but going it was. I was having my second cup of lemon tea when the trio of Centuros crested the final rise. They weren't happy. Joshua yelled at me saying, "I am so disappointed in you, Shumi. You just left us and buggered off. This was not a matter of skill. We were worried about you and what if we needed your help?" My gloat disappeared pretty rapidly. My rapid, uneventful ascent of K-Top deflated from a glorious achievement that swelled my chest to a vague feeling of guilt. I usually feel awesome about myself. But this was not one of the those times. Deciding to quickly descend the mountain, we watched other bikes struggle, slide and fall. Our Centuros were like mountain goats by comparison. Two corners later, the only snow that remained was on the sides and our descent was rapid. Back at South Pullu, Lendel said, "I'm glad I decided to complete the ride. It didn't look like fun, but it feels great to have done this." I think that summed it up for all of us. An hour later, we were parked at our hotel reliving one of the hardest rides of our lives in our heads. We started out on the ride thinking we would have to really push the Mahindras to get it done. We realised in the afternoon sun in Leh that the Centuros had done their job. And in the process, we had risen above.